The nine-day Navratri festival in Karnataka is famous for the Bombe Habba or Gombe Pooja – it is the display of traditional dolls and miniatures of characters in Hindu Scriptures. The dolls display also includes miniatures of gurus and saints. Other highlights are agriculture and industrial related dolls, flora and fauna and other traditional aspects of the particular regions. Bombe Habba is enthusiastically followed by many families. On the first day of Navratri, Kalash is installed and arrangements of dolls are made on a stepped platform. 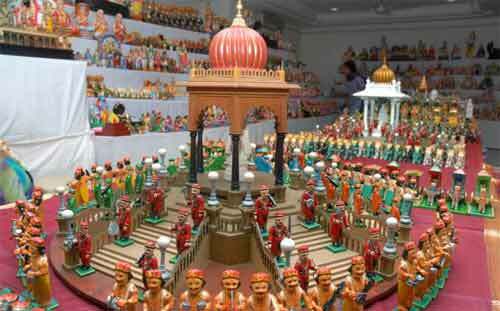 There are also devotees who arrange dolls as per a particular theme. The most important dolls are the Pattada Gombe – the main dolls. The Pattade Gombe (Raja Rani dolls) is usually handed over for generations. It is a pride of the family. The steps are in odd numbers with the pride of place given to the Pattada Gombe (the main dolls). This couple, mostly a family heirloom, is made of wood. The top rows of the display are occupied by gods and goddesses. In the lower tiers humans, plants and other traditional aspects are displayed. The number of tiers are either 3, 7, 9 or 11. One legend associates the Bombe Habba with the commemoration of the Goddess Durga’s victory over Mahishasura. Another popular legend is associated with the coronation of Rama who returns victorious to Ayodhya after defeating Ravana with the blessing of Goddess Shakti. One each day of Navratri, an Aarti is held before the Gombe Habba. Sweets and other delicacies are made and distributed. Bombe Habba is popularly known as Bommai Kolu in Tamil Nadu. In Andhra Pradesh and Telangana it is known as Bommala Kolavu.